Residency: 2 year Surgical Residency: Union Hospital, Union, NJ and Saddle Brook Surgicenter, Saddle Brook NJ. Instructor: Served on the residency training committee of Saddle Brook Surgery Center. Hospital Affiliations: Saint Clares Hospital, Denville and Dover, NJ, On staff at Emmaus Surgical Center in Hackettstown, NJ. Dr. Pizzano was born in Italy to a physician father and native Italian mother. He graduated from the New York School of Podiatric Medicine in 1993 after which he completed two years of Podiatric Surgical residency. 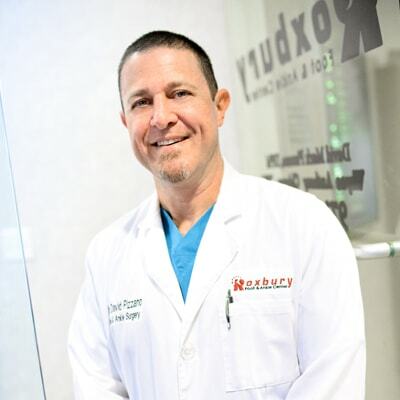 He began his career practicing Podiatry in Newton, NJ in 1995. He joined Sparta Medical Associates in April of 2007 and Roxbury Foot and Ankle Center in February of 2009. After leaving Sparta Medical Associates in September of 2012 he devoted most of his time to his Roxbury office. Dr. Pizzano specializes in foot surgery, foot and ankle biomechanics, diabetic foot care and treats all foot and ankle ailments. He also uses the latest techniques to treat common foot problems including but not limited to heel pain, diabetic wound care, nail disease and sports injuries. Other services that Dr. Pizzano provides includes custom molded foot orthotics, custom foot and ankle bracing and diabetic shoe wear. Dr. Pizzano uses computerized gait analysis to study a patient’s gait. With this data, he is able to make very accurate and functional custom foot orthotics. When foot surgery becomes necessary, Dr. Pizzano has extensive experience and utilizes advanced techniques in corrective foot surgery with a focus on aesthetic results. Dr. Pizzano relies heavily on patient education so that patients can understand and help quickly resolve their condition thus returning to an active and pain free life. How would you rate Dr. Pizzano?